Shakti 360 in the Himalayas in North India. A private charter flight is just the beginning of why we love Shakti 360° in India’s Himalayas. Exclusive, remote, with the only access by foot, there are few resorts in the world as extraordinary as 360° Leti. 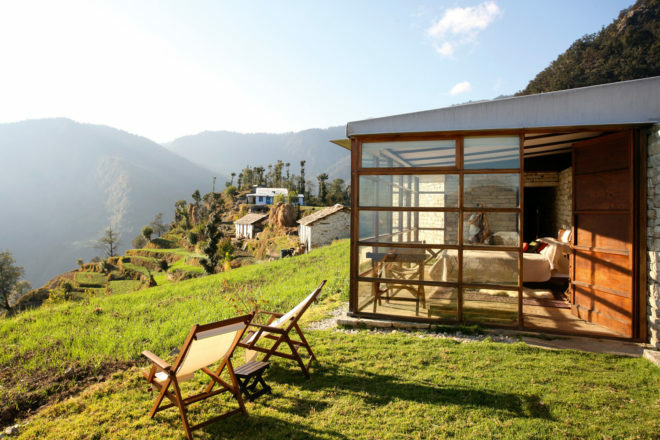 The resort sits snug under the Nanda Devi massif, which at 7816 metres is India’s second-highest mountain. With the jagged white peaks of the Heeramani glacier bearing down from the north, it’s the views that make the two-day journey from Delhi worth it. Luckily, such isolation doesn’t mean skipping on comfort. Marrying local timber, stone, canvas and glass with modern passive solar design, four guest pavilions have private terraces with fire pits, big bathrooms, Kashmir throws and floor-to-ceiling windows peering down the valley. There is no internet nor TV; instead, grab a book from the well-stocked library, hike to the villages that clutch to the sides of the surrounding foothills, or just kick back and enjoy the scenery.